…that a storied Naugatuck business had its own “navy” and that it performed espionage services for the United States government during World War II? It’s true. 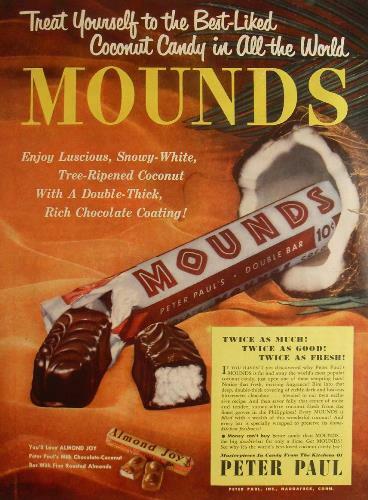 That business was the Peter Paul Company and their “navy” was a fleet of small schooners drafted to procure coconuts for their popular Mounds candy bar from several small Caribbean islands. Apparently, this “Flea Fleet,” as it was called, posed no threat to the German Navy, which was operating in Atlantic waters. So the vessels were left alone to shuttle between the islands and processing plants in Puerto Rico and Florida. What the German Naval commanders did not know, however, was that the crews of these vessels were gathering valuable intelligence about the German fleet’s movements and sharing it with the American armed forces. This article is excerpted and originally appeared in the Naugatuck Historical Society’s Newsletter. “Naugatuck Historical Society,” 2016. Link. Pugliese, Gregg. “Peter Paul’s Path To Sweet Success.” Connecticut Explored, Spring 2010. Link.